An email spam server is a mail server that uses an email filtering solution to increase the server´s spam detection rate and reduce a business´s exposure to malware and ransomware. An email spam server can be easily created by installing the email filtering solution as a virtual appliance, or by redirecting the mail server´s MX record to a cloud based service. Once the email spam server has been created, it filters incoming emails at the server level, rather than at client level. Consequently, an email spam server has a much lower maintenance overhead than a client-based solution, plus it gives network administrators a higher level of governance over network activity and the volume of threats being blocked by the server. Why Complement a Mail Server with an Email Filtering Solution? Most email services have some degree of email filtering, but rarely is it sufficient to prevent businesses receiving significant volumes of spam email. Typically default email services block between 95% and 97% of spam – which, in a large business, can result in hundreds of spam emails avoiding detection every day. Even at the highest levels of spam detection, there is cause for concern. Due to the evolving sophistication of spam email, the small percentage of spam emails that avoid detection are likely to be the most dangerous. Cybercriminals wishing to deploy a malware attack will use every trick in the book to execute their attack, and it only takes one click on a carefully-crafted link in the body of an email in order for the attack to be successful. Email filtering solutions have more advanced mechanisms than provided by default email services to detect spam email and reduce the chances of a spam email arriving in an employee´s inbox. By minimizing the volume of spam emails that avoid detection, business´s mitigate the threat from phishing, malware and ransomware. Most default email services use RBL and SUBRL filters to block spam. These compare the IP addresses of incoming emails against databases listing IP addresses from which spam is known to have originated. The likely reason why a spam email evades detection at this point is because it has originated from a source not previously used. An email spam server uses a process known as greylisting to identify spam sent from unknown sources. It does this by returning all incoming emails to the mail servers from which they originated, along with a request for the email to be resent. Most mail servers respond within minutes and the emails are returned. Thereafter they undergo a series of secondary tests to determine their authenticity. Greylisting can result in a small delay receiving messages which is why it is an optional control in SpamTitan, although it is highly recommended to enable greylisting. To avoid unnecessary delays, trusted senders can be added to a whitelist to ensure their messages are always delivered without delay. Spammers´ mail servers are usually too occupied sending out spam emails to respond to the resend request, and the email is never returned. Using this process to prevent spam from previously unknown sources, an email spam server increases the spam detection rate from 99% to close to 100% – substantially reducing the volume of sophisticated and dangerous spam being delivered to employees´ inboxes. SpamTitan has independently verified block rate of 99.97%. Email filtering solutions from SpamTitan use further mechanisms to reduce the volume of spam. Once a greylisted email is returned, our email filtering solutions run Sender Policy Framework tests, HELO tests and Reject Unknown Sender Domain tests to authenticate incoming emails. However, in order to eliminate the inadvertent blocking of business-critical emails, we also provide the tools for system administrators to apply different acceptable spam thresholds to different users or user-groups. These tools can be useful if, for example, a business has a Sales Department that receives sales leads by email from miscellaneous sources. In this scenario, a system administrator could relax the acceptable spam threshold for employees within the Sales Department while maintaining a high threshold for the rest of the business. It is also possible to apply acceptable use thresholds by domain if required and whitelist trusted domains to prevent a delay in the receipt of business-critical emails. Despite the additional mechanisms and tools, SpamTitan is one of the simplest email filtering solutions to use. Our Gateway (virtual appliance) and cloud-based services are managed via a web-based administrative portal with an intuitive interface. System administrators can apply and adjust the filter´s parameters with the click of a mouse from any Internet-connected device. It is also possible to schedule quarantine reports at any time of the night or day. SpamTitan uses several predictive methods for detecting new threats, such as subjecting each incoming message to a Bayesian analysis. Machine learning and heuristics also help to greatly improve spam detection rates and prevent malicious and unwanted messages from reaching users’ inboxes. Email services provide a degree of protection against spam and malicious emails, but many threats slip through the net. Organizations that add an additional layer to their email defenses and adopt a third-party spam filtering solution will achieve far greater spam detection rates. 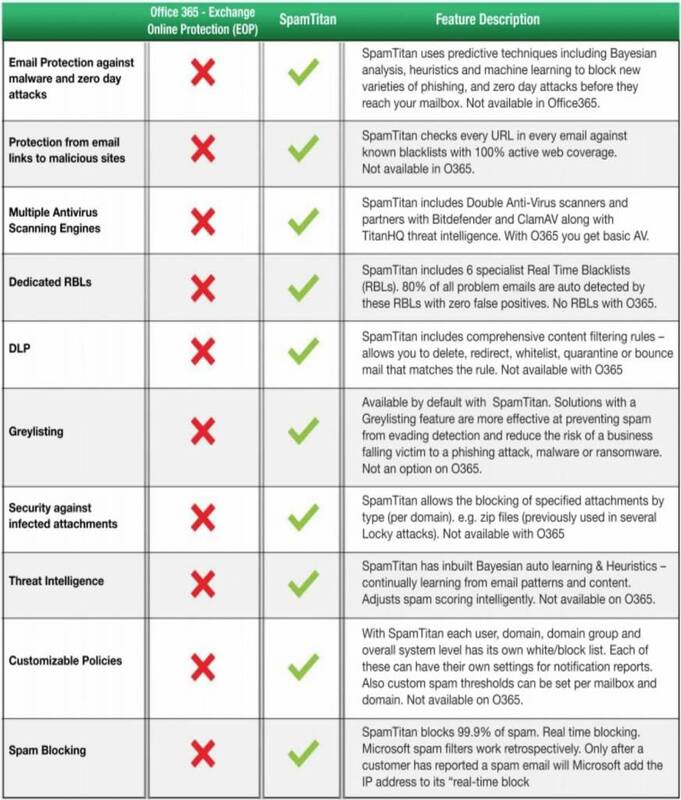 Office 365 has many built-in security features; however, organizations that have grown accustomed to dedicated security solutions with advanced filtering and advanced reporting capabilities are likely to find that the default security offering of Office 365 falls short of requirements. SpamTitan’s spam detection rate has been independently verified and shown to block 99.97% of spam emails. This is achieved through the use of advanced spam detection mechanisms such as SURBL filtering, machine learning, Bayesian analysis, and greylisting. SpamTitan also uses a variety of malicious URL detection mechanisms to detect phishing emails and dual anti-virus software engines are used to detect and block malware and ransomware threats. The result is enhanced spam detection and more reliable blocking of spam, phishing emails, zero-day attacks, and new malware and ransomware threats. 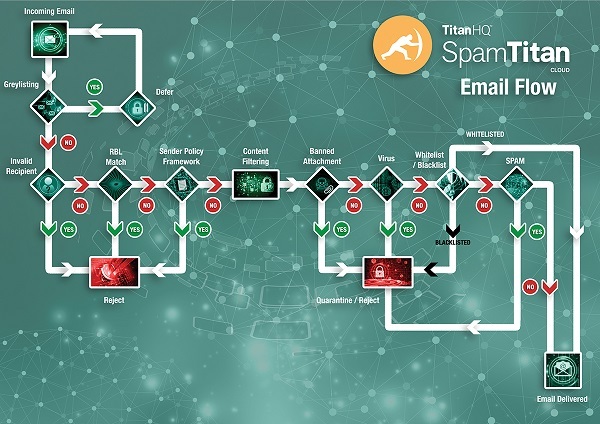 If you would like to reduce the volume of spam avoiding detection in your business, and better protect your network against phishing, malware and ransomware, speak with us about creating an email spam server with an email filtering solution from SpamTitan. Our team of Sales Technicians will be happy to answer any questions you have about maximizing the spam detection rate and the other features of SpamTitan that can help enhance network security. Our team will also invite you to take a free trial of SpamTitan in order that you can evaluate the merits of an email spam server in your own environment. The trial will give you the opportunity to find the appropriate spam threshold levels for each department in your business so that, should you choose to continue using our service at the end of the trial, no further configuration of the email filtering solution will be necessary. Contact us today to find out more and start your free trial. Cybercriminals and spammers are becoming more sophisticated. Standard email filters only block spam from previously known sources. A SpamTitan email filter can be configured to block spam from new sources. Different acceptable spam thresholds can be applied per user or user-group. The email spam server can be administered from any Internet-connected device. Take advantage of our free trial offer to experience the benefits of SpamTitan today.